Client: Disney Parks. All brand tracks. Audience: Search engines. 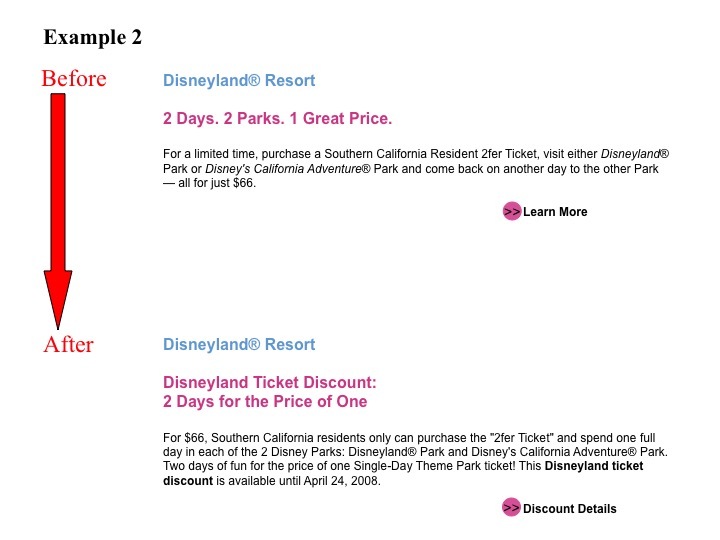 Anyone searching for discounts on disneyparks.com. Define the word 'discounts'. Establish when and how this word can be used. Write metadescriptions for link graphics / images on the website to increase search results and provide data for screen readers. Discount project: Received support from Business and Legal to use the word 'discounts'. Search improved. Guests found their discounts. 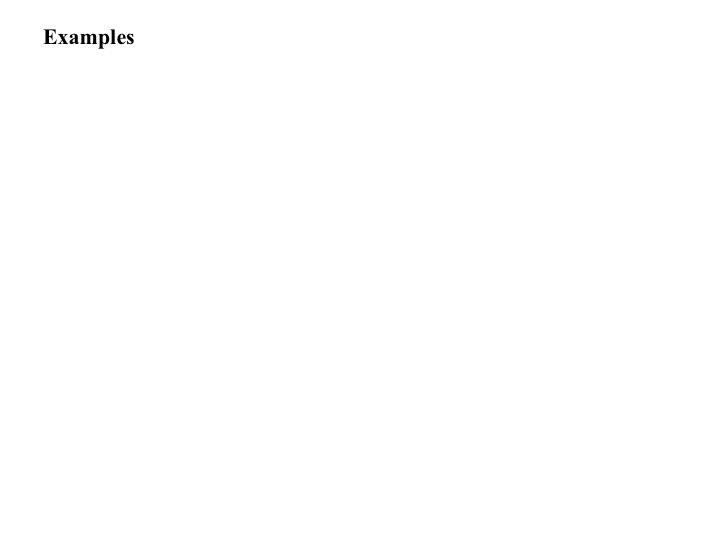 Metadescriptions: Ultimately, image metadata was written in massive batches by various writers with conflicting direction. This metatext was included in the image library——meaning the same description was used for the same image across all sites. An efficient approach, but in conflict with the SEO direction that copy——no matter where it appears——should provide context. Copy in context of the story on the page. Copy as context. Every story has a conflict. Business and Legal teams refused the use of the word 'discounts' on Disney sites. SEO proved this word was by far the most searched term. The challenge of this project was to improve search results and Guest satisfaction while not diminishing the Disney brand. As project copywriter, I created copy to be scanned, fortified copy with keywords—in context, used actionable & concrete information with no disclaimers, and defined where and when the words 'discount' and 'special offers' could be used. All teams involved were pleased. Search improved. 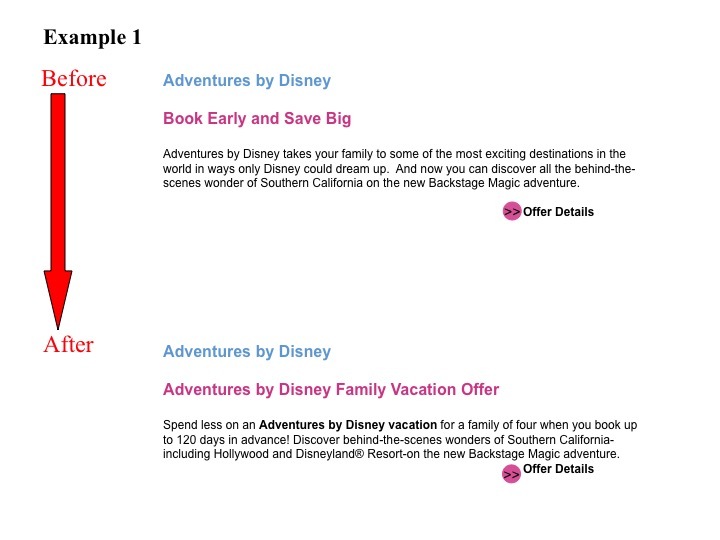 Eventually, other brand sites began using 'discounts', too—which improved the Guest experience across Disney sites, since they received the content they matched their search. One of the biggest challenges while trying to achieve both these goals is that sometimes the direction can be conflicting. For improved SEO, context, context, context is everything. If the same image is used throughout the site, the description needs to be different——since the focus of each page is different, and the description should speak to the focus. For screen readers, copy shouldn'tinclude (or should minimally include) sight words, such as color, but should somehow describe or allude to the image. As more writers were included, and I moved to another project, the balance of this project shifted in favor of screen readers. For my metadescriptions, I did my best to address both goals. Wine Country Trattoria serves a mix of Italian and California wine-country-influenced dishes and offers a “preferred” option to see the nighttime water spectacular, World of Color. A futuristic scene set on the city planet of Coruscant. Find out where else you can go on the recently reimagined Star Tours — The Adventures Continue attraction. Tarzan’s Treehouse. Virtually tour it and get fun facts about this Disneyland Park attraction. Disneyland Characters, like Woody from Toy Story, and a happy boy. These are good reasons to have an Annual Passport. California residents can now use the Monthly Payment option to purchase or renew. I took all the images on this site, except for 6.